You assemble the Feed to the OMT/BUC for nominal horizontal receive polarisation, with the 505 on the feed throat away from the feed support arm and LNB filter upwards. You later rotate the entire complete dish for setting nominal polarisation plus polarisation angle adjustment, using the giant circular scale behind the dish. Please read the previous two sentences above twice more, to make sure you clearly understand this. 1. Stand behind the dish and look over the top towards the satellite. This is what you should see for Horizontal nominal receive polarisation. Now apply + or - adjustment. Use the scale numbers. 2. Effect of turning the entire dish 90 deg clockwise. 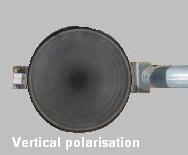 Vertical nominal receive polarisation. Start here if you have a negative polarisation adjustment angle to apply. Ignore numbers on the scale. Count along the tick marks for the amount of degrees needed. 3. Effect of turning the entire dish 90 deg anti-clockwise. 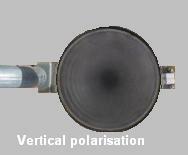 Vertical nominal receive polarisation. Start here if you have a positive polarisation adjustment angle to apply. Ignore the numbers on the scale. Count along the tick marks for the amount of degrees needed. It is now a matter of applying the polarisation adjustment angle. If the polarisation adjustment angle is positive, rotate the whole dish clockwise, while facing towards the satellite. If the polarisation adjustment angle is negative, rotate the whole dish anti-clockwise, while facing towards the satellite. 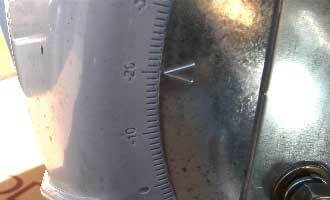 There is an arrow pointer like this < on the rear plate, at the left side, aimed at the polarisation scale. This scale is really good, it is accurate and easy to use and you don't need a magnifying glass to read it! Loosen the four polarisation bolts and rotate the dish by the required polarisation adjustment angle amount. Clockwise, while facing towards the satellite in the sky, is positive. Set the polarisation angle accurately - the scale clearly shows 1 degree intervals. If you are operating with a Eutelsat satellite, add 3.5 deg to the calculated angle before applying it to the polarisation scale. 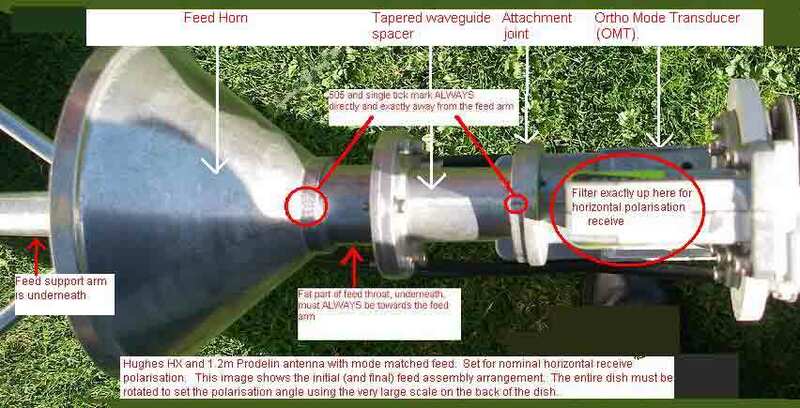 This feed is described at "ASSY 39 DEG EUTELSAT FD"
The throat of this feed horn, marked 505, has three internal mode matching slots machined on the inside which cause cross polarisation performance opposite to that generated by the offset-antenna geometry. The net result is superb cross-pol performance for the complete antenna. For this to work properly, the three slots must oriented towards the feed support arm, regardless of the polarisation set. The feed horn comes with a spacer section of tapered circular waveguide, attached to the feed horn at a fixed angle. The 12 hole rear flange rim of the waveguide spacer is marked in two places, at 90 deg to one another, with a single score and a double score marking, 90 degrees apart. The 505 on the feed throat and the single score mark on the rear flange of the spacer must be oriented directly away from the feed arm always - regardless of the polarisation required. To provide consistency with earlier web pages and with the Prodelin documentation that comes with the feed. Note the circular joint, between the rear flange of the spacer tube (12 holes and where are the single and double tick marks) and the flange of the OMT/Filter. This joint may be undone and the OMT/LNB re-attached at an alternative angle. This changes the polarisation in 30 deg steps. There is no need to know about this as you have a giant polarisation scale behind the dish which will achieve any polarisation, vertical, horizontal plus any adjustment. Vertical nominal receive polarisation is achieved with the single score mark on the spacer flange at the top, the double score mark on the spacer flange at the side and the OMT/LNB side arm is at the side also. View from above. Note that the 5 0 5 markings on the feed throat and the single tick mark on the rear flange of the tapered waveguide spacer must always be on top and directly away from the feed support arm underneath. This image shows the TRF filter/LNB assembly attached for vertical receive polarisation. In the Prodelin documentation is a diagram showing feed assembly. In my copy it refers to polarisation but did not say if this referred to the transmit or receive polarisation. It referred to the transmit polarisation. This was confusing. 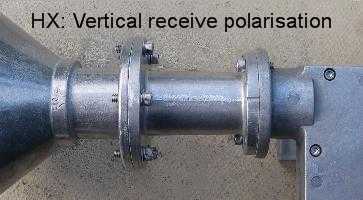 Receive polarisation is the direction of the dipole pin inside the LNB rectangular waveguide. 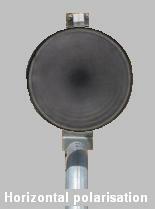 If the broad faces of the LNB waveguide are on either side that is Horizontal polarisation. In the northern hemisphere, if the satellite is due south it is high up and there is little polarisation adjustment needed. If the satellite is to the south west then clockwise adjustment is needed. If the satellite is to the south east then anti-clockwise adjustment is needed. In the southern hemisphere, if the satellite is due north it is high up and there is little polarisation adjustment needed. If the satellite is to the north west then anti-clockwise adjustment is needed. If the satellite is to the north east then clockwise adjustment is needed. 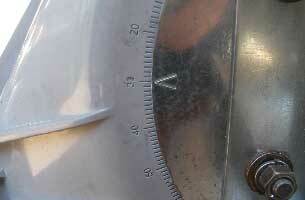 If you are near the equator large polarisation adjustments may be required, approaching +/- 90 deg. The polarisation adjustment required may vary a great deal from one location to another nearby when the elevation angle is almost straight up. With the above mode matched feed the "505" on the feed throat must always, at all times, be directly away from the feed support arm.